It’s not a national holiday, at least not yet. But that doesn’t stop people from celebrating. National Beer Day is today. The day is historically relevant because it commemorates the date in 1933, when the Cullen-Harrison Act, signed into law by President Franklin Roosevelt, went into effect. That allowed beer to once again be legally manufactured and sold in this country. Enough states then approved the 21st Amendment later that year to formally bring an end to Prohibition, which started in 1919. So, while National Beer Day isn’t a national holiday, it doesn’t mean you can’t celebrate. Peaks and Pints presents a craft beer flight of the nation. You’ll board on the East Coast and end in the Hawaiian Islands. Craft beer Crosscut 4.7.19: A Flight For National Beer Day is ready to board. Brooklyn Brewery is one of New York’s first post-Prohibition craft breweries. Started by Steve Hindy and Tom Potter in 1988, Brooklyn Brewery hired the nattily dressed Garrett Oliver as their brewmaster in 1994 and have reaped a great deal of success ever since. Especially in 2014, when Oliver won the James Beard Award for excellence in the category “Outstanding Wine, Beer or Spirits Professional.” Basically, Brooklyn Brewery reintroduced Brooklyn palates to locally made beer, and in many ways revitalized Williamsburg as a whole (things were not always tres chic there). Sorachi Ace is one of the most popular and highly rated beers made by the brewery. The namesake hop, originally developed in Japan for Sapporo Breweries in the 1970s, gives this dry, effervescent saison its distinct lemony aroma, with the Saaz-like spicy pepper character really kicking in when you finally let your tongue in on the action. There are also pronounced traces of honey and pear, and dill, which might not be strictly necessary, but it definitely does no harm and adds a layer of complexity that elevates Brooklyn Sorachi Ace into the highest ranks of American farmhouse ales. St. Louis brewery Perennial Artisan Ales has spent their time bringing fresh and new ideas to the world of craft beer while still respecting classic traditions. And with owner and head brewer Phil Wymore (formerly of Goose Island and Half Acre) at the helm, the results have been extraordinary. 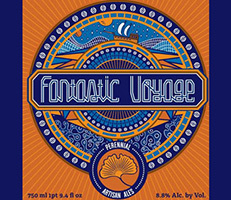 Perennial brewer Jim Leabig wanted to drink a German chocolate cake, so he brewed Fantastic Voyage — a harmonic melange of coconut and imperial milk stout. Loads of coconut, lactose and black malt balance each other to provide flavors reminiscent of chocolate covered coconut with light vanilla and a finish smooth like silk sheets. Flavor is moderate to heavy sweet, light to moderate bitter and delicious to super delicious. A rotating-hop series is a singularly named beer that uses new, sometimes not-even-named-yet hops with each release. It’s a chance to drink fresh IPAs, learn about some new hops and don’t overthink it. Colorado brewery Oskar Blues has a Mountain IPA Series in play. According to the series hype, “Experimental hops. Boundary-pushing IPAs. East Coast? West Coast? Neither. Stay High.” OK. 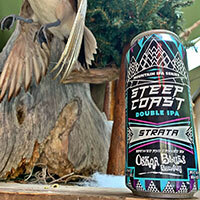 Peaks and Pints has Oskar Blues Steep Coast Strata in our lodge. In a nutshell, Strata (formerly known as X-331) is an open pollinated German born Perle hop that was growing in a backyard in Corvallis, Oregon. Strata expresses many of the oils associated with mango, oranges, and other fruits and herbs. In this Oskar Blues double IPA, strata contributes a nice balance of citrus and pine with a strong malt backbone. 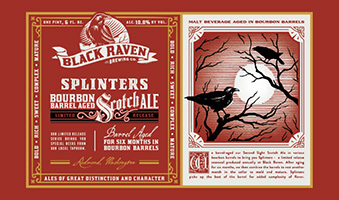 Black Raven’s Second Sight Strong Scotch Ale was transformed after resting in bourbon barrels, emerging as Splinters Strong Scotch Ale. Aged for many months in various bourbon barrels, Splinters picks up the best of the barrel for added complexity of flavor. All of the barrels are then combined and the beer is aged for another month in a stainless steel tank to meld and mature into a sweet ale, with bourbon, vanilla, caramel and a scotch ale finish. Our national tour of beer ends on the island of Maui where the 2016 Great American Beer Festival Gold Medal Field Beer champion Imperial Coconut Porter is brewed. A deeper, more intense version of Maui Brewing Co.’s flagship Coconut Hiwa Porter, Imperial Coconut Porter is brewed with hand toasted coconut, and subtle hints of cacao and coffee. The rich, slightly sweet and malty ale utilizes seven different malts, including black and chocolate, as well as raw and toasted coconut. It pours with a dark tan head and drinks with a silky smooth, yet warming finish.